Just Look at that Ocean! Tired of the same old concrete tourist towns filled with Denny's, Comfort Inns and car stereos so loud they make your dog bark? Then vacation in Flagler Beach! A quiet, Old-Florida beach town with pristine beaches, a pier, pelicans gliding along the dunes, miles of oceanfront bike paths and nature walks. Flagler Beach is the last rural beach town on the east coast with a population under 5000! 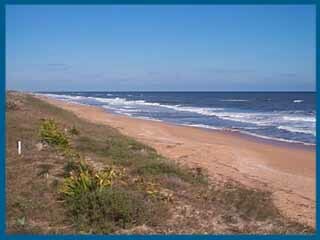 Flagler Beach is located on Jimmy Buffet's famous A1A, the longest designated Scenic Highway on the east coast. There are no cars or buildings on the beach! Visit our great restaurants, art galleries and gourmet shops. Near to Jacksonville, St. Augustine, Orlando, and Daytona, yet far enough away to remain pleasantly unspoiled. Spend your vacation with us! Your hosts, Barry & Patricia.